I can't take credit for this idea - it is actually stemmed from a creation of one of my Clients. She serves it at her annual Holiday Cocktail Party that I used to cater. My parents were one of her guests and my Mom was still talking about this drink weeks later. That's always my indicator of something that is really great at a party... it is usually what people are talking about on the way home, the next week and sometimes the next year! Combine all of the ingredients in a large pitcher. To serve, dip the rim of the glass in water, then into crushed candy canes. Shake cocktail mix with ice, then strain into glass. Serve with cranberry or candy cane garnish. Crush up the candy canes - I recommend doing this in a ziplock... unless you want pieces of candy canes all over your kitchen. 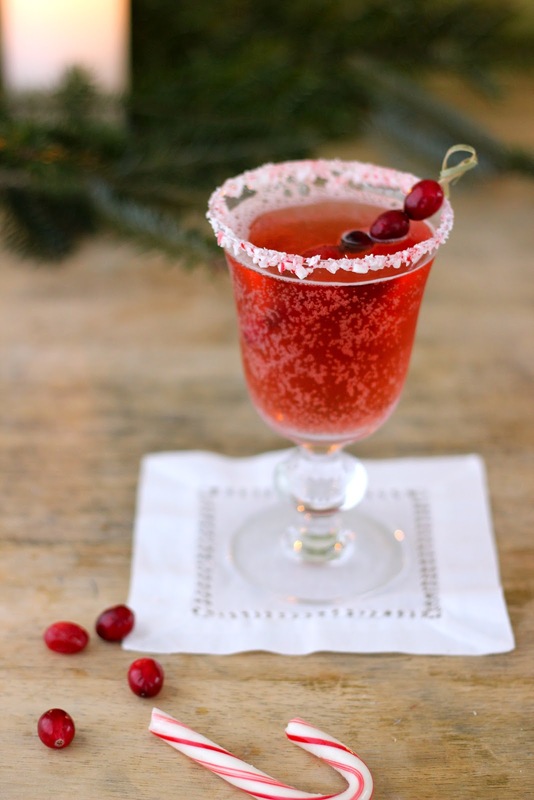 The peppermint rim is my favorite part of this drink - it goes so well with the tart cranberry! Stay tuned for more cocktail recipes! My husband will be all over this. Thanks! What a perfect holiday cocktail!